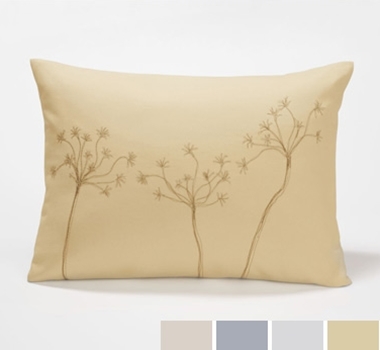 These 14 by 20-inch pillows add a touch of botanical beauty to any sofa, chair, or bed. Stitched in charcoal grey on organic cotton canvas, this artful motif captures both natural simplicity and sophisticated design. Pair it with neutrals to emphasize its understated grace or with bold colors and prints to bring out a sense of whimsy. Each pillow comes with an organic insert stuffed with organic fibers from the kapok tree. These inserts are moisture-resistant, quick-drying, lightweight, completely hypo-allergenic, mold resistant and odorless.